Immunology in the Twentieth Century: From Basic Science to Clinical Application grew out of common knowledge that those who survived many of the common infectious diseases rarely contracted the same disease again. 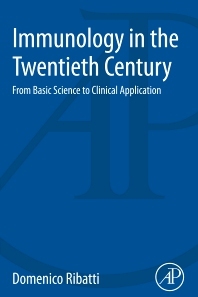 This book charts the historical development of this vital branch of medicine in a concise volume, covering both the basic science involved and the clinical applications. Immunology as a distinctive subject developed in the mid-twentieth century as researchers started to understand how the adaptive immune system aids the defense against pathogens. The subject has grown in importance and diversified into specialist fields, such as immunohistochemistry, immunogenetics and immunopathology. Domenico Ribatti was born in Andria, Italy, on December 27, 1956. He was awarded his M.D. degree on October 1981. His present position is full professor of Human Anatomy at the University of Bari Medical School, Italy. Domenico Ribatti is author 8 monographs. History of research on tumor angiogenesis, Springer, 2009. The chick embryo chorioallantoic membrane in the study of angiogenesis and metastases, Springer, 2010. Protagonists of medicine, Springer, 2010. Mast cells and tumours. From biology to clinic (in collaboration with E. Crivellato) Springer, 2011. Morphofunctional aspects of tumor microcirculation, Springer, 2012. Angiogenesis and anti-angiogenesis in hematological malignancies, Springer, 2014. Development of immunological competence, Springer, 2016. The role of microenvironment in the control of tumor angiogenesis, Springer,2016.